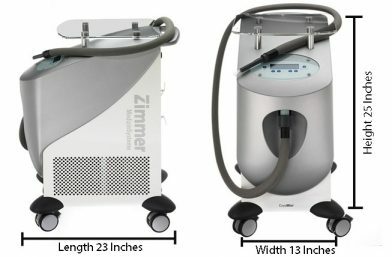 The Cryo Mini offers a smaller footprint yet provides the same incomparable Zimmer quality as its full size counterpart, the Cryo 6. 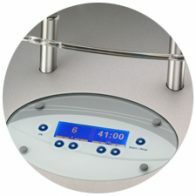 The device cools with cold air. It is therefore always ready for use without the need for add-on supplies or consumables. Unlike with other cooling methods, such as contact cooling, cryogen spray or ice packs, the Cryo Mini can cool the epidermis before, during and after the laser energy has been applied, without interfering with the laser beam. The robust chiller delivers 1300L of air per minute. It filters and cools regular room air down to -10°C with a closed loop circuit. 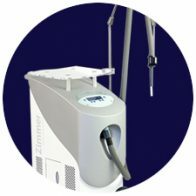 The Mini Cryo is the perfect chiller to complement an array of laser procedures. 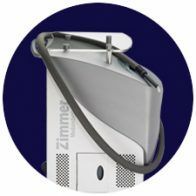 With the Cryo Mini, Zimmer MedizinSystems offers this compact, flexible option for short and less painful treatments. The skin cooling system can provide temporary relief from cosmetic injections. Likewise, the application of cold air during laser treatments can lead to a distinct reduction in pain and may reduce thermal tissue damage. Whether Laser, IPL applications or injections, cold air is designed to effectively reduce pain. As a result, treatments can be tolerated significantly better. 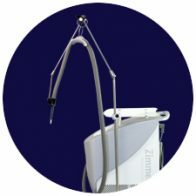 Available for your Zimmer Cryo Mini is an optional articulating arm. 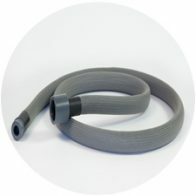 The articulating arm gives gentle support to the hose, allowing hands-free operation for the practitioner. The same immediate relief begins for the patient when you position the articulating arm over the treatment area and press start. Maintenance is easy! Just vacuum the air filter (don’t remove) and empty the condensation collector once a week. The Cryo Mini chiller unit performs additional self-maintenance every time you power it on with an automatic self-test of operational components. 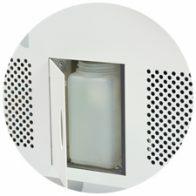 The Cryo Mini flat Plexiglas top platform provides a convenient location for an IPL system, smoke evacuator, laser, or storage for other items. Handy shelving right where you need it during procedures! This lower capacity, more compact chiller device is ideal for smaller treatment rooms. The unit is lighter than the Cryo 6 and is very easy to transport when needed. The handy custom designed Plexiglas top, hands-free operation, 9 speed fan, lightweight treatment hose and easy maintenance combine to provide the ultimate in convenience and control for practitioners.